Lithuanian Ornithological Society in cooperation with the LITGRID AB, the Lithuanian electricity transmission system operator, organised international seminar “Birds’ protection practices on electricity grids”, which was held on 28-29 June, 2018, in Vilnius. 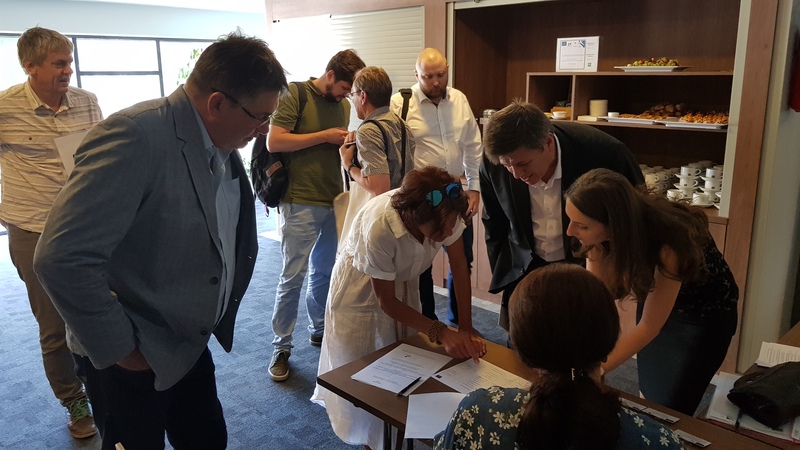 The main aim of the event was to invite relevant stakeholders (representatives of the Ministry of Environment of the Republic of Lithuania and its subordinated institutions, electricity grid operators from different countries, producers of the bird protection measures for electrogrids, etc. ), birds’ experts, scientists, representatives of national and international green route NGOs, to share experience of different countries, discuss the problems and achieved project results, conclude best known practices, which are the most effective for the reduction of the birds’ mortality on electricity grid. Participants from Portugal, Bulgaria, Belgium, Germany, Sweden, Belarus and other countries shared their experience with the Lithuanian colleagues. This seminar was one of the final activities, organised in the frame of the EU LIFE+ project “Installation of the bird protection measures on the high voltage electricity transmission grid in Lithuania” (No. LIFE13 BIO/LT/001303). The project is coming to the end this year, therefore it was a great opportunity to share the findings and experience, gained in Lithuania, with the international audience. The second day of the event was devoted to the field trip. Participants visited project territories, where the protection measures on the high voltage electricity grids have been installed. The LOD staff showed the grids with the protection measures, which increase the visibility of the wires and protect from the short circuit the birds, as well as nesting boxes for Common Kestrel, which have been erected on the electricity pylons. Participants also visited Zuvintas Biosphere Reserve, which is one of the birds’ paradise in Lithuania with thousands of birds in various seasons. There they got a unique opportunity to see outcomes of another LIFE project „LIFE MagniDucatusAcrola" – 50 juveniles of Aquatic Warbler brought from Belarus have been raised in Zuvintas with the aim to restore local population of this globally threatened bird.